BSMS309 Methanol synthesis catalyst is widely applicable to methanol plants employing various technologies, including medium or low pressure processes such as Lurgi and ICI. BSMS309 Methanol synthesis catalyst is widely applicable to methanol plants employing various technologies, including medium or low pressure processes such as Lurgi and ICI. 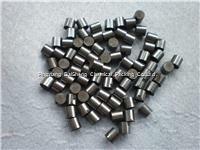 Properties of the catalyst were greatly enhanced after a remarkable improvement was made on its preparation technology. As the result, the catalyst is featured by higher activity,higher space time yield and CO conversion, better thermal stability and tolerance to heat, longer service life, better selectivity, higher methanol concentration and less organic by products in raw product, wide range of operation condition, ease in reduction and operation, higher strength and little pressure drop across the bed. The catalyst is based on copper and zinc. Test condition: 5.0MPa, 230-250℃, GHSV 10000h-1, CO at the inlet 6-10%(vol), catalyst amount 3ml, catalyst size 20-40 mesh. Catalyst is reduced via TPR. standard: space-time yield of raw methanol min1.0ml/ml·h, and min0.8ml/ml·h after being kept at 400℃ for 3～5h.